A neuroma in the foot is one of the more common running injuries that keeps runners from training. This is irritation of the nerve that runs between the metatarsal bones at the ball of the foot, which is why it is often referred to as an intermetatarsal neuroma. 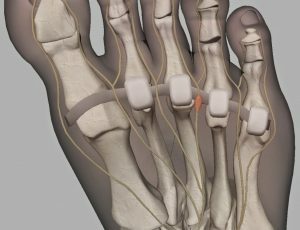 You may have already heard about a Morton’s neuroma which is actually a neuroma specifically located at the ball of foot between the third and fourth metatarsal bones. A neuroma is a swollen nerve. In the simplest of cases it is basically just a swollen and irritated nerve that runs along the bottom of the foot and out to the toes. When these nerves become irritated they can swell and create the earliest signs and symptoms of a Morton’s neuroma. Part of the reason a neuroma can be such a problem in runners is that the swollen nerve can move back and forth across a ligament at the ball of the foot as you run. Because the swollen lump is moving back and forth across this ligament it can become more and more irritated every time your heel comes up off the ground when you push off and run. The swollen neuroma can also pop back-and-forth across the intermetatarsal ligament when you pull your toes upward as your foot swings forward underneath you as you run. With continued irritation, such as running up hills or running in shoes that are too tight, the swollen nerve can become more irritated and more inflamed. When that happens the nerve will actually develop additional nerve endings in the region of swelling within the nerve and become a more chronic problem. A neuroma in the foot can develop for a number of reasons. I have seen many runners who developed a neuroma when they were far into their season and started doing hill repeats to gain strength and speed. I have seen other runners that actually developed a neuroma because they were cycling for cross training but their cycling shoes were really too tight. Interestingly, I have also seen a couple of runners who developed a neuroma simply from stepping on one of their kids Legos when it was left on the carpet. So whether you stepped on something and pinched the nerve, or you compressed the nerve when running up hills, or you squeezed the nerves between the metatarsal bones with cycling shoes that are too tight you have to make sure that you don’t make the mistakes that can lead to long-term trouble. Here are some of the most common mistakes I see runners make when they start to develop a neuroma in the ball of the foot. One of the earliest descriptions of a Morton’s neuroma explains that the patient will often describe a sensation of wet leather being stuck to the bottom of the foot. In my experience however runners don’t usually run in wet leather and so most of them don’t even know what that sensation would feel like. What I do hear from runners is that they will say that for a long period of time it felt like there was a wrinkle in their sock or something in the running shoe. Often times they’ll say that they even went so far as to stop in the middle of a run, take the running shoe off and check the sock to see if there’re any wrinkles or material inside. In most cases of course they found nothing because there was nothing wrong with their shoe or their sock. The problem is with the nerve at the ball of the foot. At this point the nerve has a little bit of swelling surrounding the nerve. It is mildly irritated but it’s not really damaged yet. There’s a collection of fluid around the nerve that’s compressing the nerve and causes these odd sensations. But if it’s ignored the nerve can become temporarily damaged and causes sensation of numbness. So one of the early signs and symptoms of a Morton’s neuroma is numbness. The numbness is typically in the middle of the toes, but sometimes runner’s will just perceive the pain or numbness to sort of generally affect the whole ball of the foot. This is the first symptom that seems to get a runner’s attention. Although it is sort of getting your attention and distracting you, it’s not acutely painful and because it’s not really painful the runner may not take any steps at all to prevent the nerve irritation from progressing. If the runner completely ignores this odd sensation and developing numbness in the ball of the foot, in the middle toes due to the accumulation of fluid around the nerve it’s not just going to stay around the nerve but then the swelling and inflammation will start to happen within the nerve itself. And that can lead to more permanent damage and chronic pain. When nerves become irritated, they become over active and in response to all of this activity they can develop additional nerve endings. So the nerves sprout little tiny nerve endings that have synapses which send chemical signals back and forth to talk to each other and when the lump in the nerve at the ball of your foot starts to develop these additional nerve endings which talk to each other all the time, you perceive that little conversation as pain. Burning, tingling, radiating pain or electrical sensations that start at the ball of the foot and shoot out into the second, third or fourth toes are the symptoms that actually bring runners into the podiatrist office. Keep in mind, that once these burning tingling symptoms develop, the nerve has been irritated, compressed and damaged for a long period of time. The nerve doesn’t heal quickly. But they will heal if treated early enough and correctly. The second mistake that runners seem to make this mistake when it comes to a neuroma in the ball of the foot, they misinterpret the pain as a stress fracture. A metatarsal stress fracture is likely the most common source of pain in the ball of the foot in a runner who is training for a marathon or any other long-distance race. Because it’s so common it is easy to find information about it and in the early stages the symptoms may kind of match the descriptions that you would find about a metatarsal stress fracture. So it’s not too surprising to learn that many runners will think they have a stress fracture when they actually have a neuroma. It’s just a slight misinterpretation of the symptoms. The problem is that a metatarsal stress fracture will heal fairly consistently and quickly if you simply decrease the amount of stress applied to the metatarsal bone. But that can mean a lot of different things. It can mean walking on a fracture walking boot or using crutches. It can also be as simple as decreasing the running volume. But no matter which treatment you choose to reduce the stress enough, the metatarsal stress fracture is going to heal. But that’s not true for a neuroma. You have to think about the neuroma as a sore thumb. Once it swells, it seems to get in the way of everything. The nerve may get even compressed under your body weight when you step on it because after all its swollen, it is larger. The nerve is swollen. The nerve may even get knocked back and forth between the metatarsal bones on either side of the nerve once the nerve swells up. That creates a real problem because then you might decrease your activity and start to lose all of your fitness. But even as you watch your well-defined quads and the prominent veins in your calves disappear, the nerve is healing very slowly. If you’re still walking enough to irritate the nerve, or if you’re walking in tight shoes like dress shoes that can further compress the nerve or if you’re walking in high heel shoes that can stretch the nerve and compress it under the intermetatarsal ligament, it may not heal at all. In fact, the neuroma may even get worse. That is when real frustration sets in. The runner knows that their goals are disappearing on the horizon. In spite of all of the time spent on the couch, they don’t really seem to bee improving in terms of the pain in the ball of the foot. That’s when runner starts to lose hope. So the first thing is to make sure that when you have pain in the ball of the foot that you’re not treating it as a stress fracture when it could be a neuroma. Doctors just love to preach cross training to runners. Although I will admit that as a doctor and a triathlete I believe cross-training can be extremely useful to endurance athletes and long-distance runners. I think that runners have to be very careful with cross-training when they have a neuroma. Orthopedic surgeons seem to frequently recommend elliptical trainers as a way to reduce stress and impact that is more common in running. But the problem with an elliptical trainer is that it puts an enormous amount of stress right on the neuroma. Every time your heel comes up off the platform at the end of the backswing your foot snaps upward it stretches the nerve underneath the intermetatarsal ligament right where the nerve became irritated in the first place. Because an elliptical trainer requires so much less effort than running many runners will spend an hour or more on the elliptical trainer. All of that time pushing on the ball of the foot can really abuse and aggravate the neuroma. Cycling can really be a great way to decrease the forces and spread out the stresses that can accumulate with only running. Cycling can also help you maintain your aerobic fitness with relatively low risk to your foot. So lots of runners will take up spinning or cycling as an alternative when they develop a neuroma. But there are two real problems that can happen with cycling with a neuroma. To function well, cycling shoes have to be very stiff and fairly narrow. This combination of a rigid carbon fiber outsole coupled with a narrow toe box really helps to keep your foot from moving around and helps to increase the efficiency when you peddle. But that tight stiff shoe is quite unforgiving when you have a swollen nerve at the ball of the foot. With every pedal stroke the nerve is getting compressed and irritated. To make matters worse, spin classes will have you change the amount of resistance to vary the workout. So when you reduce your resistance dramatically and then you increase the revolutions per minute and you’re peddling at a hundred to a hundred twenty rpm’s, a lot of cyclists will bounce around in the saddle in a way that’s really unpredictable. All of that bouncing around at high speed can pinch the nerve. One of the first line treatments of a Morton’s neuroma is a neuroma pad or a metatarsal pad. Regardless of the name it’s basically the same thing. It’s just a teardrop shaped dome pad that’s supposed to be positioned under the forefoot. Many runners put them in the wrong place. The dome shaped metatarsal pad is supposed to shift pressure away from the metatarsal heads at the ball of the foot at the level of the metatarsal heads, right where the nerve typically swells and becomes irritated. The pad shifts pressure to the neck and shaft of the metatarsal bones to relieve the pressure at the nerve. 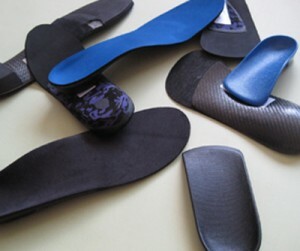 The unique shape of the metatarsal pad is also designed to lift and separate the metatarsals to increase the amount of space between the metatarsal heads. When positioned correctly, the metatarsal pad can separate the metatarsal bones on either side of the neuroma so that the neuroma isn’t pinched and irritated by the neighboring metatarsal heads. The mistake that I see runners make is that they think that they need to cushion under the painful spot. So instead of putting the pad behind the ball of the foot they actually put the metatarsal pad right under the ball of foot right where the nerve is swollen. When a runner accidentally puts the pad in the wrong spot, it increases the force and irritation to the neuroma. So the whole plan backfires. Many runners will say that they tried to use a pad but it didn’t work. I ask them about that and then I look at the running shoes on the insert in the running shoe where the pad was located. Often times when they tell me that the treatment didn’t work, I can tell by looking at the insert on their shoe that the pad was simply in the wrong place. The biggest mistakes I think runners make is they jump to surgery. Let me begin by saying that I am biased. I am a foot surgeon. I love to cut people open and fix things. Yet, I almost will never perform neuroma surgery on an injured runner. There are a couple of reasons why I think runners should try hard to avoid surgery on a neuroma. The first reason is that we don’t actually fix anything. We just take out the nerve. This is the only place in the human body where surgeons typically remove a nerve as a standard course of treatment. The second reason is that I don’t think you should have surgery, if you can avoid it, is that the way that the surgery is typically performed can destabilize your foot. The doctor makes an incision on the top of your foot near the base of the toes. The surgeon then dissects down between the metatarsal bones and finds the intermetatarsal ligament. 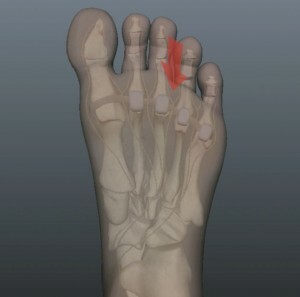 Then the surgeon cuts through the intermetatarsal ligament to find the swollen nerve which is underneath that ligament. The surgeon cuts out a Y-shaped section of the nerve and the swollen neuroma is removed. The skin incision is sewn back together with sutures. Now keep in mind the intermetatarsal ligament that we cut apart in surgery is never sewn back together. Because we don’t repair that ligament, it can destabilize your foot. That ligament is part of what prevents your foot from splaying apart like a duck when you walk. So when we cut out the nerve, we don’t sew the ligament back and your foot becomes unstable as a result. So again, although I am both a runner and a foot surgeon it makes me really nervous to cut a runner’s foot open and cut through that ligament just to get to the nerve. But that’s the way the surgery is performed. The only other alternative is to make a big incision on the bottom of your foot that can put you at an increased risk of problems with a painful scar. And believe it or not that’s actually an even more difficult problem to fix. 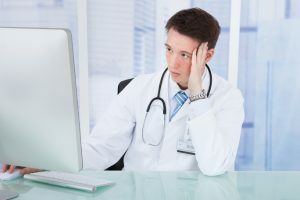 The bottom line with all of this is that if you had any of these symptoms of pain in the ball the foot, particularly if it involves odds sensations, numbness, burning pain, radiating pain or any type of electrical sort of shooting sensations, you have to consider that it might be a neuroma. The other thing to remember is that a neuroma doesn’t get better very quickly. So although they can get better, they don’t get better as rapidly as musculoskeletal problems like a strained tendon, a torn ligament or metatarsal stress fracture. If you think you have one of those other conditions and you tried to treat it, and it doesn’t get better quickly, you have to make sure that you don’t have a neuroma . Because if you irritate that nerve enough you either have to live with chronic pain or you have to live with the potential of invasive treatment like surgery. And above all else, remember, no surgery is the best surgery. Especially for a runner!